All creation stills its reverent spirit-song. Reaching for the strength and holding back the tears. Far away the music sings. Many loved ones to its dawn. Bring peace within my trembling calm. Yet from the pains of birth we pray all truth appears. All whose hearts cry freedom's ring. Peace for loved ones far apart. Peace above the battle's toil. 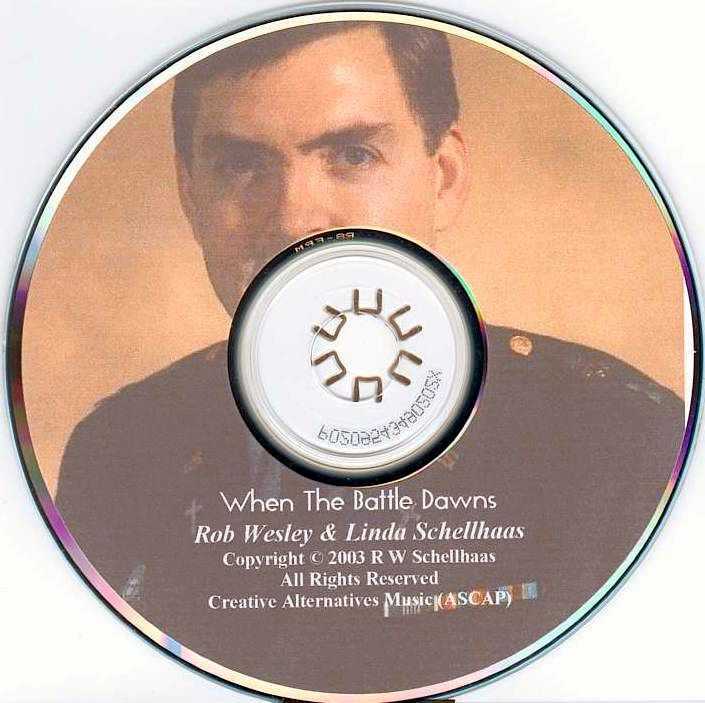 I use the performing-name "Rob Wesley," but I'm also a retired U.S. Army Chaplain (9 years 1980-1988). From Feb. 1980 - Dec 1982 I was chaplain for the spearhead taskforce of the 2nd Brigade, 24th Infantry Division (Mechanized), Fort Stewart, GA-- basically the same taskforce headed toward Baghdad now as the 2nd Bde, 3rd Infantry Division "Spartan Brigade." I've been watching this war build for months (I even got a call in January, asking if I'd be willing to serve if needed), and I've been watching live coverage as much as possible since its onset. Watching my "old unit" drive forward into Iraq brought the distant battle close-to-home. My concerns were with the soldiers and servicemembers, yet also greatly so with the families and loved ones, as well. On Thursday night (before 2 a.m. Friday) I was watching MSNBC's coverage and I was startled to see reporter David Bloom interviewing the chaplain of my old task-force, on the front-lines! This was quite startling to me, since this was "my old job." On Friday night, 3/21/2003 we were told that my daughter's partner, a former Marine, was good friends with one of the Marines killed in the first helicopter crash, Marine Staff-Sergeant Kendall Waters-Bey. That seemed to be the last straw, so to say-- the war was even closer to home now, and all so quickly. I sat in silence, feeling this dead-calm, and this song came to me. I began to record the idea that was in my head, and then the next afternoon I drafted my wife to do some harmony-vocals, and lacking a drummer on short-notice, I added a moderately acceptable tambourine/hand-drum track. It is my hope that this song can offer some sort of comfort and solace to the military families and loved ones, as well as our nation as a whole, and the other nations involved as well.